Common, so events in medieval history are at present not known. from time immemorial, customary grazing and other rights. in many places to the copyhold tenants only. must have sensed that this was not forthcoming. by an unusually large number of inhabitants, several just making their mark. to be established to defray all expenses. whole common to an actual freehold allocation of part of the common to each in compensation. fewer than 20 affluent householders, mostly yeoman farmers. consisted of open farmland almost as far as the eye could see in any direction. as they would share in it. Tatham of Bedford-place, London, a lawyer, was appointed, for “putting the Act into execution”. 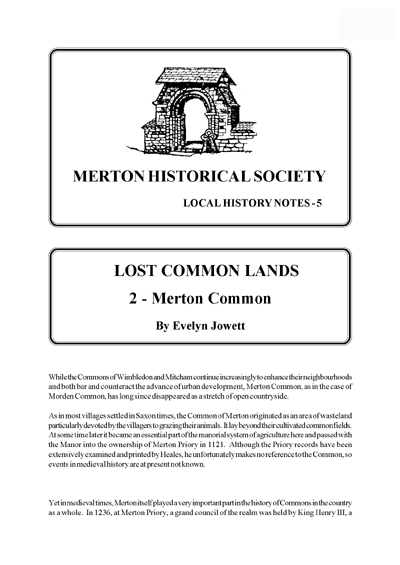 The Merton Common Act, 1816, describes the common as consisting of 90 acres or thereabouts. minister as well in 1827.
was near Cherrywood-lane and Leamington-avenue and the Morden Parish boundary. common. He also received his costs for promoting the act from the commons expenses account. acres in the extreme south-east. the common and one of the few features on it, shown on early county maps of the eighteenth century. travelling from one part of the village to another as freely as before the common was enclosed. to the Relief of the Poor at £1 per acre”. Dallett, Paterson and Sutton, all on the south side of Martin-way. White, another farmer, not only retained as tenant his own enclosure but rented that of Skelton. been actually on the common and they are not identifiable in the 1851 Census. accounts even for its original establishment there. 15th and 22nd March 1974. Miss E M Jowett , Vice President of the Society, died in August 1990.
from Maycross-avenue, once an old right-of-way confirmed in 1817. This entry was posted in Publications, Local History Notes and tagged in lhn, merton.